I have been eating curry all my life. Even when I was a small girl, a spicy meal of rice and curry would make me want to rub my belly with happiness. Once moving to the United States in the early 1970's I quickly came to realize that curry was not all that common here. I became fascinated with burgers, pizza and spaghetti, but my first love of curry always remained. Over the decades, the world has changed and become more diverse. Curry is becoming more common and I have a lot of friends who ask me how to cook it. 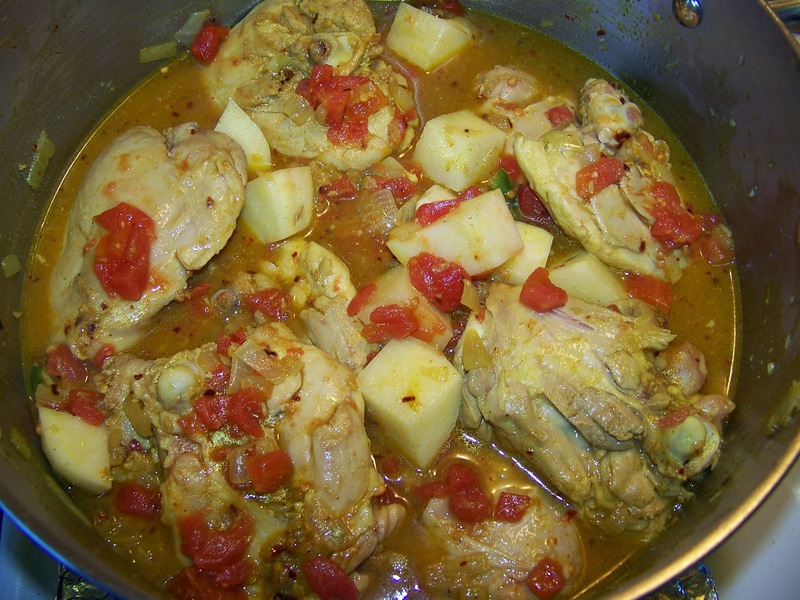 A traditional Sri Lankan chicken curry uses a lot of spices and aromatics other than just curry powder. I love the flavors that the curry leaves, pandan leaves, lemongrass, fenugreek seeds, turmeric powder, cinnamon stick, cardamoms and cloves all give a chicken curry. 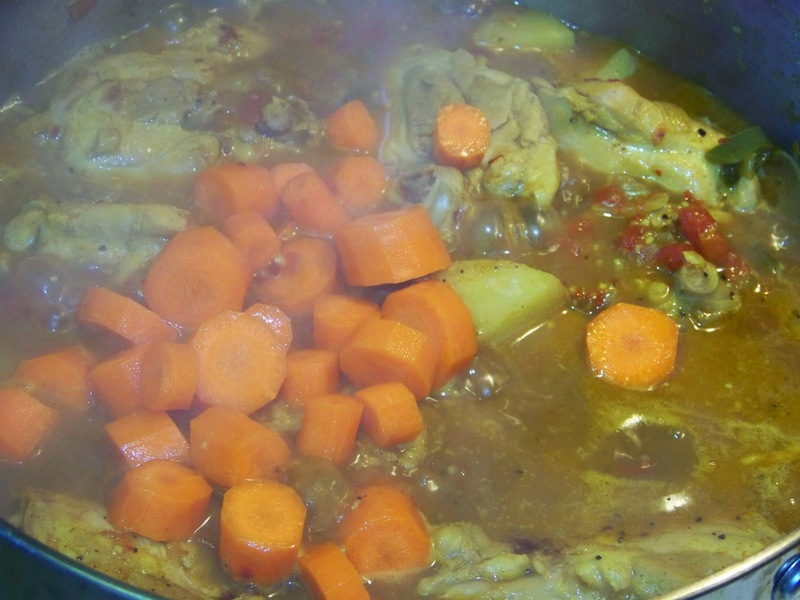 Unfortunately, unless you cook curry as much as my family does, all those ingredients are expensive to invest in if you are only cooking one pot of chicken curry once in a blue moon. So, I decided to simplify a chicken curry to the bare essentials. 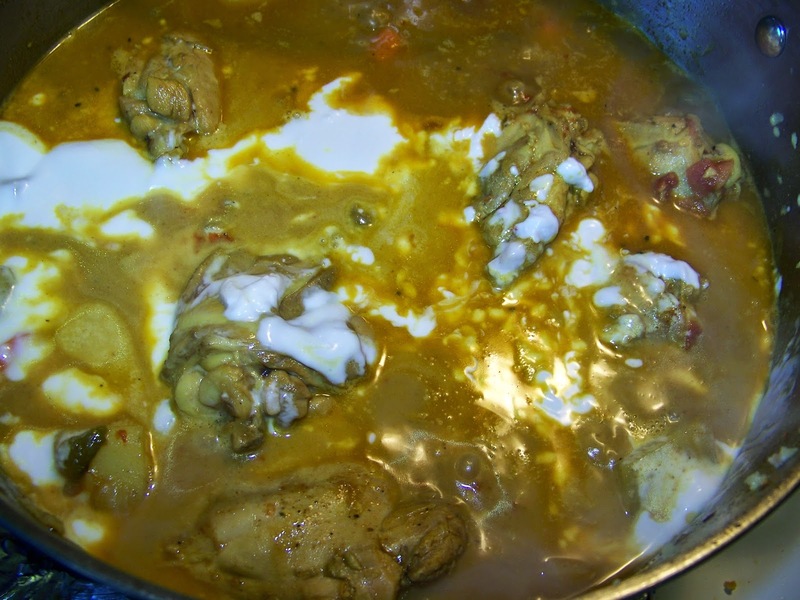 I took out all the exotic ingredients and made a chicken curry anyone in the U.S. can make from ingredients at your local grocery store. The most important of course being curry powder. 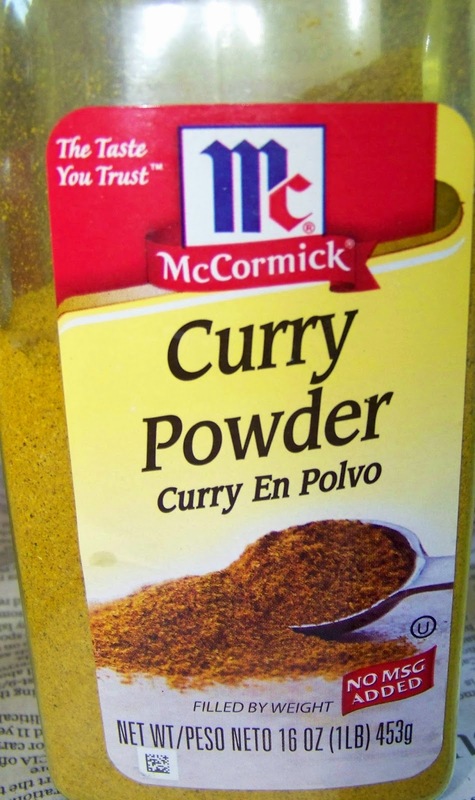 I bought an American brand of curry powder called McCormick Curry Powder. I am not affiliated with them, nor is this an advertisement for them. I am just a consumer of their product and I love the mild curry flavors this brand gives. The other ingredients that may not be as common are fresh ginger and coconut milk. I have walked through many U.S. grocery stores and I find that ginger and coconut milk are also becoming easily available. Tip: Remember to peel ginger and keep leftover ginger in a freezer safe bag in your freezer. 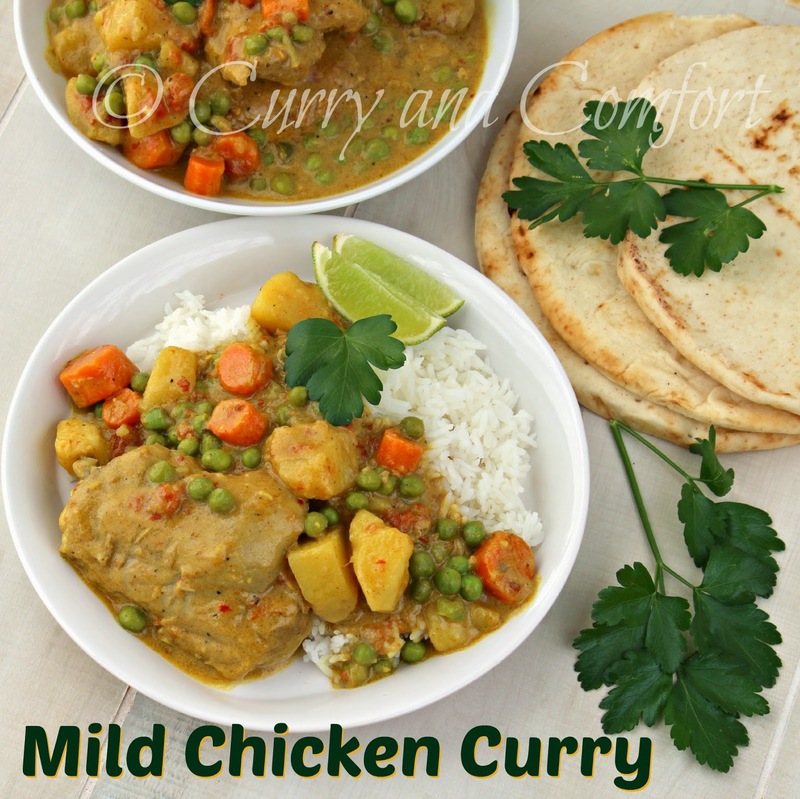 So for all of you that want to cook curry, but are afraid, try this simple mild curry to try out. In a large pan heat 2Tbs canola oil on medium heat. 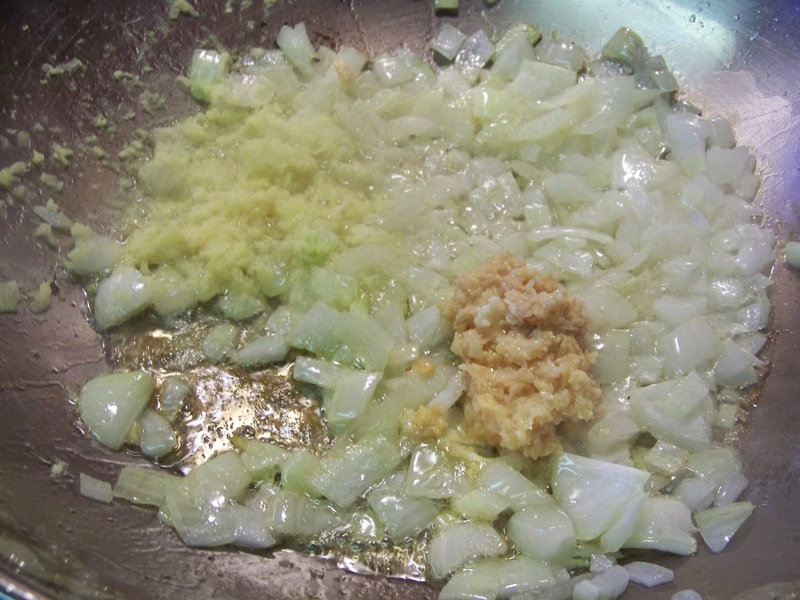 Then add diced onion, ginger and garlic and saute for 3-4 minutes. Next add chicken, salt, black pepper and saute for another 2-3 minutes. 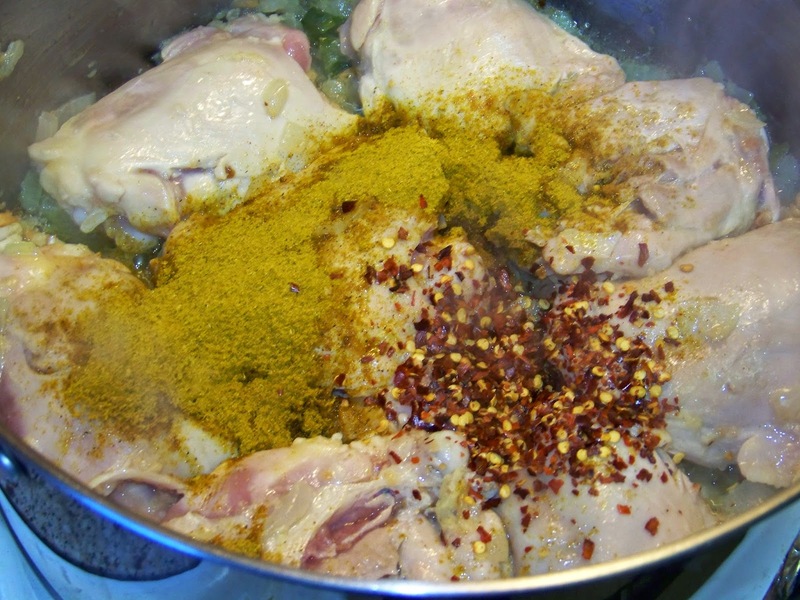 Then add curry powder and red chili flakes. 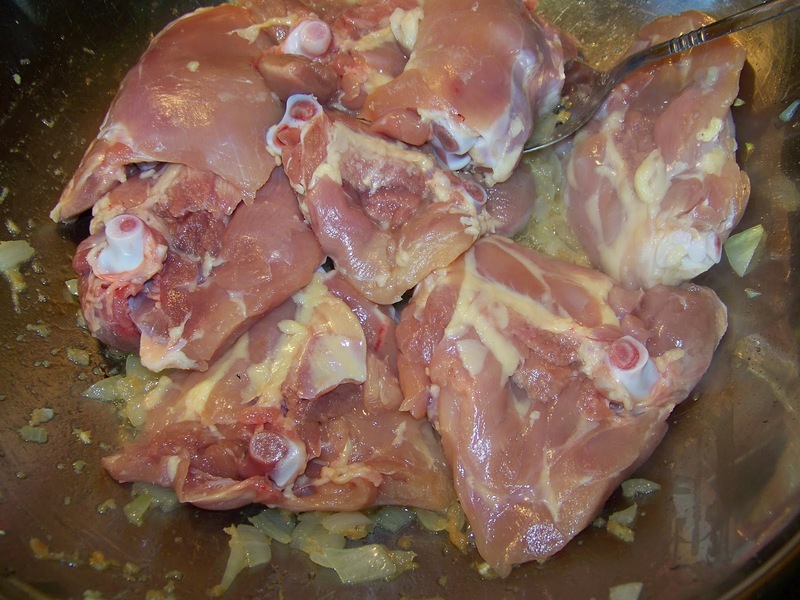 Toss with chicken and saute for a minute. Next add 2-3 cups of water or chicken stock to pot. 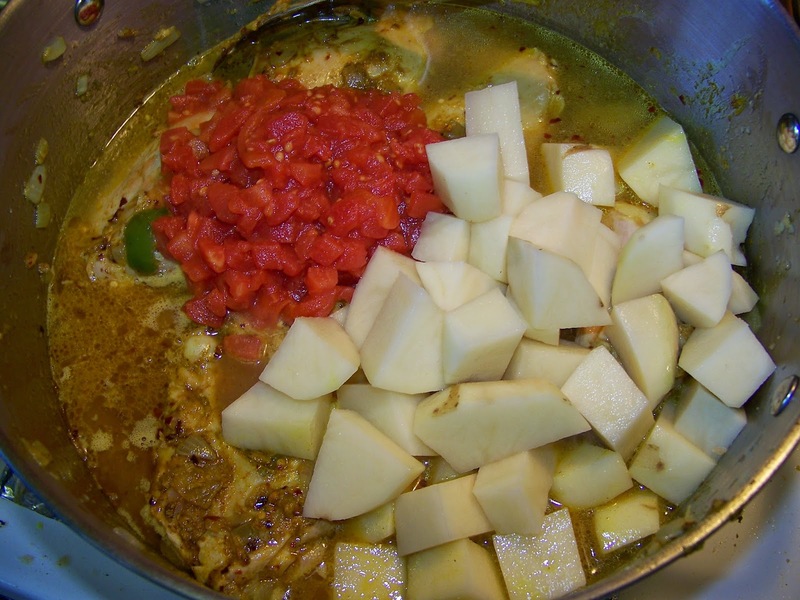 Then add the diced canned tomatoes and potatoes. Cook for 15 minutes on medium high heat. Next add the carrots and cook another 15-20 minutes. Then add the coconut milk and stir well. Taste for salt and seasoning. 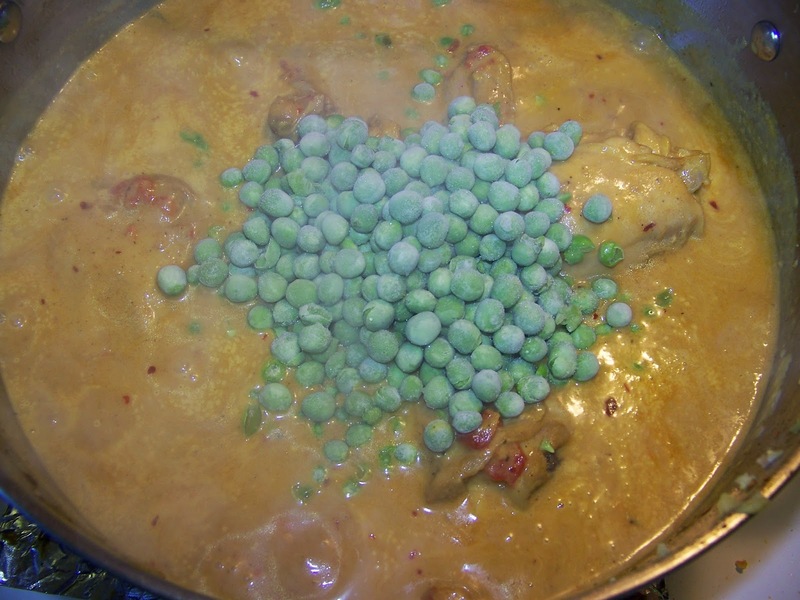 Finally add the frozen peas and stir into curry. Serve hot over rice or with naan. Enjoy. Of course this looks wonderful! Everything you cook looks wonderful. It's nice that you broke down the recipe into readily available ingredients. I am wondering, though, what other herbs, spices or aromatics would you normally include in a curry like this? I love curry. I have a good friend from India and when he travels home he always bring me a curry blend home. Curry is a beautiful complex spice. Thanks for sharing this great recipe. We didn't eat much curry growing up so I really never developed a taste for it until I became an adult. 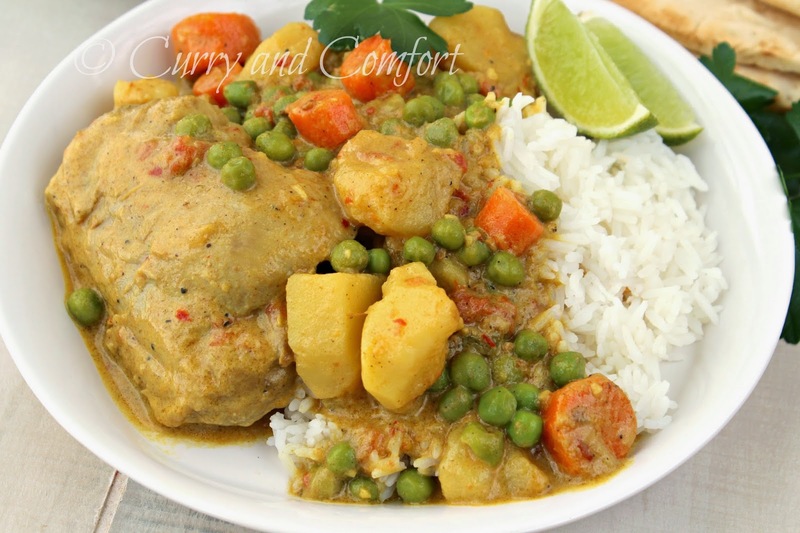 Now I love it and I do love your chicken curry recipe! I'm a huge curry fan, but I'm a curry fan that loves it hot and spicy! In fact, I order it spicier than they offer at restaurants - but it's because I love the flavor so much. Great recipe - thanks for sharing! 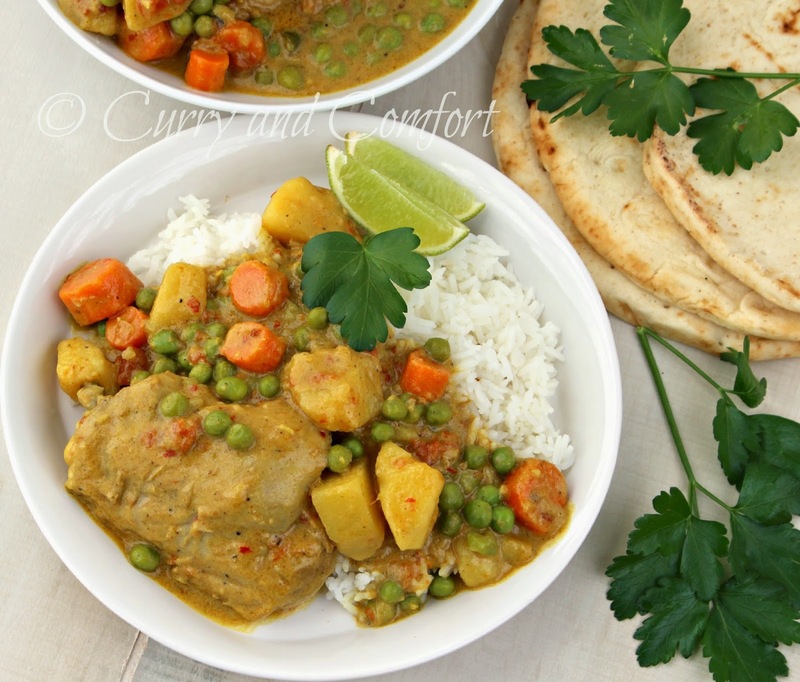 My family would enjoy this less spicy curry---it looks terrific! And thanks for the reminder to peel the ginger before freezing. Great tip. Great job, this look wonderful. Our weather has turned chilly again and this would be so good right about now! Nice...I like a milder curry.